California's Houweling's Hothouse Group is taking sustainable farming to a whole new level with its new greenhouse project, which incorporates both solar PV and a solar thermal array. 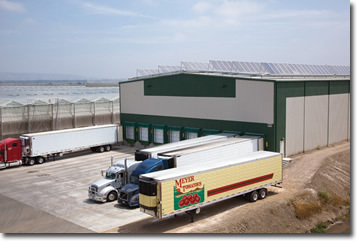 The project included approximately 500 solar modules on the roof of the Houweling's Hothouse packinghouse. Since the packinghouse building was new, they worked with the structural engineer who did the design to integrate the solar mounting system right into the roof structure-and they saved money. Not many people can use "high tech" and "tomato farming" in the same sentence, but Casey Houweling certainly can. Houweling's new 20-acre greenhouses in Camarillo, California, are raising the "sustainable" bar when it comes to growing tomatoes-and alternative energy. Houweling, president and CEO of Houweling's Hothouse Group, has spent years planning, permitting, and building what is arguably the most sustainable greenhouse operation in the world. In fact, it's the world's first high-volume greenhouse to bring together hybrid energy sources, nutrient and water recycling, and conservation systems. Construction on the project began in July 2008, and the greenhouses were completed in September and November of 2008, with the solar array being energized late in June of this year. This past May, more than 500 people from around the world came to see the results. There was a lot of excitement about this first-of-its-kind complex, with a $50 million price tag, that was using technology to take advantage of every kilowatt and ounce of water available. The operation includes, among other things, two 20-acre Ultra-Clima greenhouses, a five-acre water retention pond, five acres of solar panels installed over the water retention pond, and a solar thermal array designed into the roof of the new packinghouse. The two Ultra-Clima greenhouses were designed by KUBO Greenhouse Projects. They allow Houweling to regulate air humidity and temperature and achieve high production yields through increased light levels and enhanced carbon dioxide levels. By eliminating 90 percent of the roof vents, Houweling was able to increase light levels in the greenhouses by 16 percent and reduce the loss of carbon dioxide he injects through the air circulation system. The greenhouse water treatment system recycles condensation, rain, runoff water, and fertilizing nutrients. This has resulted in a 66 percent decrease in water use and a 50 percent decrease in fertilizer use. New computer technology lets Houweling track all this information in real-time, giving him unprecedented control of the growth of his tomatoes. Houweling installed the solar PV to cut down on electricity costs. Although the solar array hasn't been running long enough to produce exact figures, Houweling estimates it will cover approximately 50 percent of his electrical needs-and eliminate over 1.5 million pounds of C02 emissions annually. The 1 megawatt solar thermal array is used to heat the water that controls the nighttime temperature of the greenhouses. Heat collected from the panels, as well as from the warehouse refrigeration exhaust, is stored in million-gallon hot water storage tanks and then circulated through the houses. 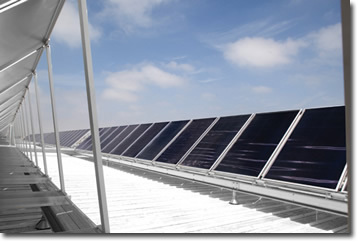 Houweling chose American Capital Energy to design and install the solar systems. He says it's been a good fit. "At the end of the day, you choose a partner that you feel comfortable with. And that is what this one was about." The solar portion was a turnkey project, which was something Houweling says he really wanted. "We were putting two other greenhouses into operation, a packaging shed, new offices, and other stuff," he says. "We basically had our hands full, because we were general contractors for the rest of the operations." Steve Ellicott, director of business development for American Capital Energy, says the first big challenge was finding a place to put the panels. "The unique part about Casey's application was a water retention pond. I worked with my design engineers and told them this is a perfect place to put a solar farm." Mounting the solar panels above the retention pond offers the necessary square feet and is a good dual-purpose use of valuable land; it reduces evaporation from the pond; and makes a big statement in front of Houweling's greenhouses. American Capital Energy designed an elevated structure of galvanized steel to house the approximately 6,500 Schüco solar panels. The design also included a tracking system. "The solar panels will track the sun from sunup to sundown. Basically they pivot on an axis from east to west," says Ellicott. "By doing that, we get approximately 25 percent more energy out of the solar panels than if they were stationary. So there's a big economic gain by doing that, in terms of quicker payback and greater long term savings." 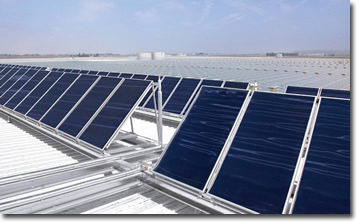 For the packinghouse, a more traditional solar thermal system was designed-approximately 500 solar modules on the roof. "Because it was new construction, we were able to work with the structural engineer who designed the packinghouse, to integrate the solar mounting system right into the roof structure and save money," says Ellicott. The designs, in particular the retention pond structure, may have been genius, but they were new concepts to Ventura County and gave them pause. To put the permitting problems in perspective, Ellicott says normal permitting takes anywhere between 30 to 60 days. Houweling's permitting took six months. "I think the issue was that the county has never dealt with anything like this before," says Houweling. "Everything was new to the guys, and they didn't know how to code it. And they didn't know the engineering that was needed. It was breaking new ground for them." But aside from the permitting issues, Ellicott says it was a great team effort. "We used a lot of Casey's contractors that were already familiar with the property. So the guys that built the greenhouse helped us erect the solar system. The electricians helped us wire the solar system. The guys that did the foundations for the greenhouses and packinghouse did the foundations for the solar systems." Houweling's system is currently net metered-basically the meter spins backward when the system is producing more solar energy than the nursery is consuming. The business then gets retail credit for the kilowatt hours put back into the grid. The system is also monitored 24/7 by a third party. The data is available to all involved with the solar system, including Houweling's customers. "It also helps us as a maintenance tool," says Ellicott. "If something should happen, we would get an alarm that tells us that the system isn't producing what it should be, and we'd send somebody out to fix the problem." Houweling's objectives for the hybrid solar system were to help fix his energy costs-in particular natural gas, which has taken enormous swings over the past two years. "If you're in an operation and are pretty reliant on energy costs, and you have those kind of swings, how do you ever budget?" says Houweling. "How do you put a project together where you're running it on a 10-year payback plan? How can you make forecasts on what's going to happen with energy?" For those reasons he wanted to create as sustainable an operation as possible, but also one where he could maintain his operating costs. "Basically we wanted to fix our operating costs for the longer term." Although Houweling was initially looking at a 10-year payback for the entire project, he's not carving that in stone. "It really depends on produce prices," he says. "It also depends on the value of the U.S. dollar." As the project comes to completion, Houweling says it's turned out very well. "Aesthetically, it looks great. And I'd like to expand the solar in the future. Right now, there are limits as to what we can do as far as the regulations are concerned." The objective for the hybrid solar system at Houweling's Hothouse was to help fix the operation's energy costs-in particular with natural gas, which has taken enormous price swings over the past two years. For Ellicott, the highlight of the project was being a part of a broader solution that Houweling has developed. "We're seeing more and more companies do this," says Ellicott. "They aren't doing these things because they are totally green. They're thinking more about the double green effect-making money, lowering their operating costs, and being proud that they're doing something positive for the environment. Casey has taken it to another level, which makes all of us at American Capital Energy proud to be associated and to be a contributor to such a worthwhile and forward thinking endeavor." For Ellicott, though, there are bigger, more personal reasons. "As corny as it sounds, it's kind of a patriotic business. We in America have to get the energy problem figured out if we want to continue to have an influence on how the world operates in the future. And if we don't, then we're going to play second fiddle to whoever does get it right," he says. "In my opinion, alternative energy production is an unprecedented opportunity for America to embrace," he adds. "We need to figure out the energy solutions that will allow us to take our country to new heights. If we don't, we're going to miss the largest economic opportunity for possibly the next few hundred years." Houweling, however, isn't looking quite that far ahead. "The next big challenge in front of us is how we can maximize what we're doing," he says. "The more equipment you put in, the more dials you have. So now we have to learn to operate with all this new high-tech equipment and maximize the productivity of the greenhouses." "To build it is the easy part," he adds. "To operate it is where the rubber really hits the road at the end of the day. I think we're doing a good job at it. I think the whole company is looking forward to seeing what we can do with it."